Just in time to commemorate 151 years of colonial settlement, Nice Rack Canada built this colour-centric ensign of tone. This July 1st, we're celebrating all of the already completed small steps forward and the massive leaps yet to come for our nation. We celebrate the diversity of our multicultural social fabric comprised of immigrants, refugees & asylum seekers that make our nation what it is today. We're also celebrating the nation that Canada will become as we move forward. A nation of progressive thought and purposeful action. A nation that will have made amends with it's First Nations people. A nation that understands that it's greatest strength is commensurate to it's weakest links and act accordingly to ensure the wellbeing of all it's citizens. A nation built upon hard work, innovation and tireless pursuit of passion & truth. 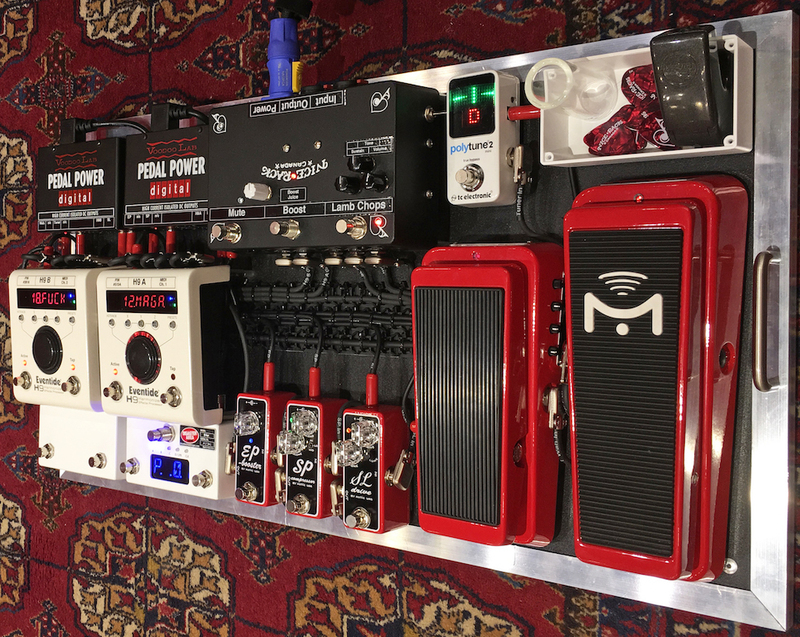 So while the fireworks are going off, a very special customer of ours will be rocking in his cottage with a pedalboard that like Canada, punches far above it's weight class. By working cooperatively with some American friends, Nice Rack Canada was able to pack a plethora of tone options into a compact footprint. Tasty analog mains from the Xotic & Nice Rack Canada circuits with sweet compliments by the incredibly versatile Eventide H9 effects host. Guitar --> Xotic Wah --> Eventide H9 A Pre Connections --> Nice Rack Canada Buffer --> Nice Rack Canada Lamb Chop (muff style circuit) --> Xotic SL Drive --> Xotic SP Compressor --> Xotic EP Booster --> Eventide H9 A Post Connections --> Eventide H9 B --> Nice Rack Canada Boost (& Split to Tuner) --> Mute Switch --> Amplifier. The system is controlled by a Disaster Area Designs DMC3XL MIDI Controller, with a Nice Rack Canada 2x Button External Switch Box and Mission Engineering / RJM Music SP-1 Expression Pedal. 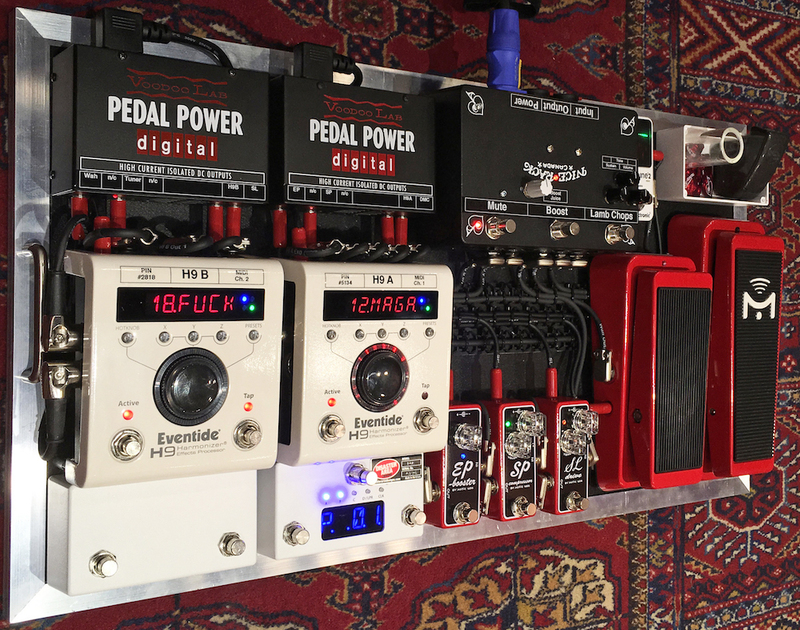 System power is provided 2x Voodoo Lab Pedal Power Digital. Whatever thought inspires you, we can turn your vision into True North Tone, Strong & Free. really like the color scheme!! Keep up good work, post more pictures!! Thanks for the kind words about our efforts.